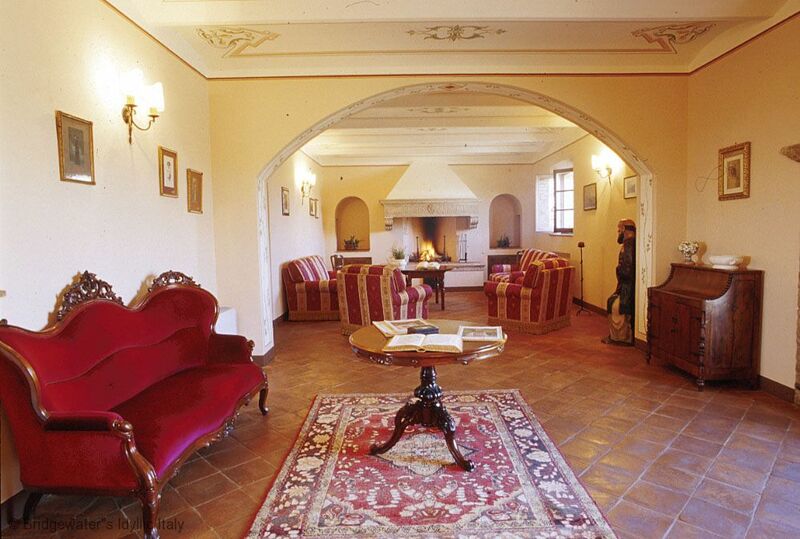 The delightful Villa Trequanda sits on an award winning wine and oil producing estate only 35 km from Siena. 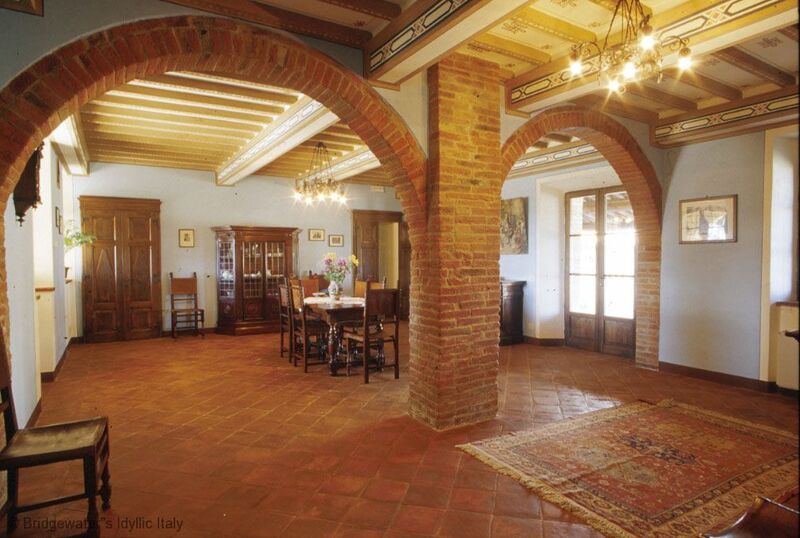 The charming property perches on the crest of a hill nestled in the heart of the Crete Senesi. The views of the surrounding countryside are simply breath-taking! Originally built in 17th century the villa has been lovingly restored to offer guests luxury accommodation and the quintessential Tuscan experience. Charming interiors, carefully furnished in a traditional style with some antique pieces; there is a natural style to the property which is difficult to emulate. The property benefits from a professional kitchen, outdoor pizza oven, wif-fi, all bedrooms are en-suite and have hair dryers, coffee machines and mini-bars. Air-con is available upon request. Cookery lessons, aromatherapy massages, wine tasting and Tuscan dinners can be arranged. The property is ideal for weddings, or large groups, as aside from the well equipped outdoor eating areas there is a large indoor dining room with panoramic views over the countryside and a large wood burning oven in the centre. Ideal for winter breaks also! 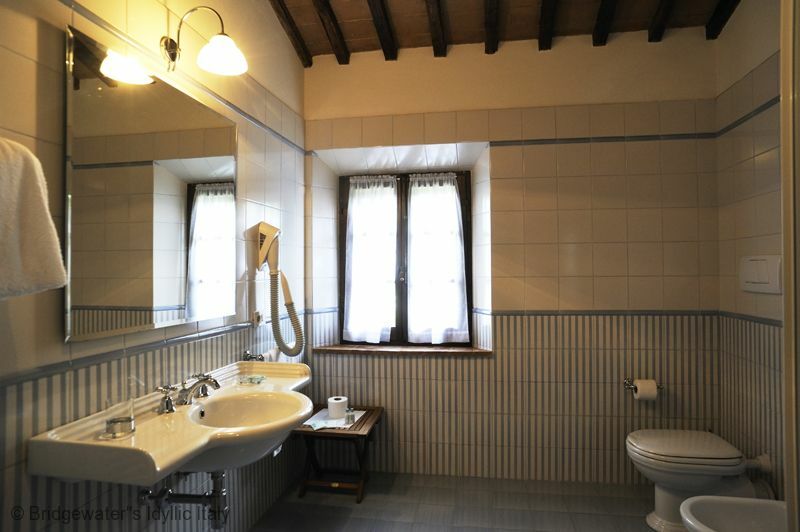 Villa Trequanda is owned by a famous Sienese family and is distinguished by its tasteful, traditional style interiors. 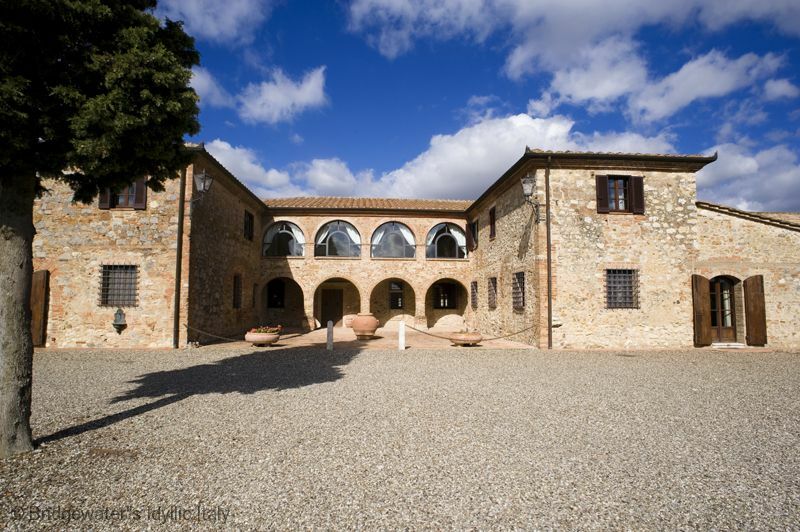 In our opinion, this is the ideal Tuscan retreat for large groups, family reunions and weddings. The owners have a nearby argriturismo - the first in Italy! - and so ideal for if accommodation needed for wedding guests. There is a restaurant at the agriturismo which guests of the villa can walk to. The local staff are incredibly helpful and will go out of their way to ensure you have a memorable holiday. The owners' daughter is a chef and will be delighted to prepare delicious meals for you. Villa Trequanda is the ideal base from which to explore the best that this area of central Tuscany has to offer with Pienza, Montepulciano, Montalcino, Cortona being within easy reach; the sea is only 130 km away and the interesting and attractive wine regions of the Chianti Classico, Brunello and Nobile, are half an hour drive away. Your Bridgewater team will happily organise cookery courses, special dinners, a cook service or wine/ oil tasting tours of the estate to ensure that your Tuscan experience is a truly authentic one! The villa is 535 sqm and has 2 spacious logge (one with pizza oven) and a panoramic 73sqm terrace from where you can dine ‘al fresco’ and take in the view. The ground floor is composed of: living room furnished with hand selected Tuscan antiques and a travertine marble fireplace and a reading room. A large professional cook's kitchen, and suite for 3 people and two further bedrooms with en-suite bathrooms. One of these bedrooms is handicap accessible - with a matrimonial bed (slightly larger than an American queen sized bed). A travertine staircase leads to the arched loggia from where we can reach the other 6 bedrooms (5 double and one triple) all of which have en-suite bathrooms, orthopedic mattresses, hair dryers, a coffee machine and a mini bar. There is also a small sitting room and a terrace with the most wonderful views; we could have sat there for hours! 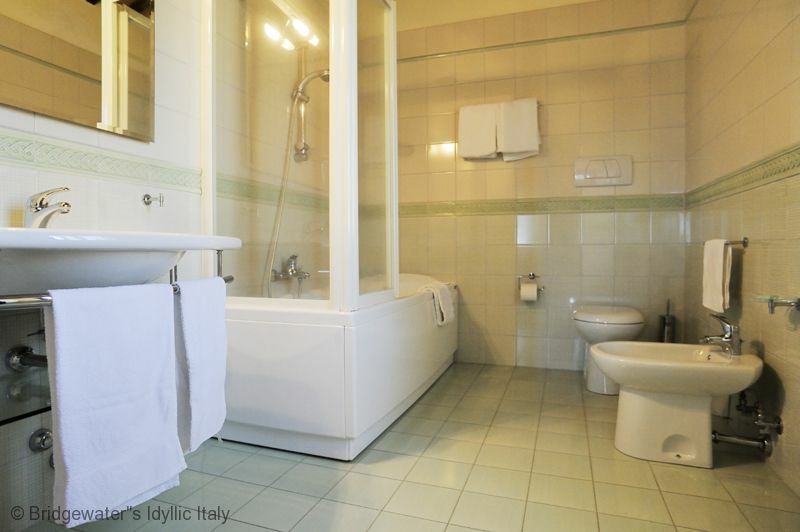 2 bedrooms have a jacuzzi tub. Five of the six bedrooms can be configured as either matrimonial beds, or twin beds, depending on the guests' needs, while the other bedroom has a matrimonial bed. Hair dryers in every bedroom. A few steps from the main villa is the Belaria, a lovely barn conversion that can only be rented in conjunction with the main villa but which creates a comfortable annex to extend the accommodation in Trequanda. Accommodation consists of a living room with fire place and kitchen corner, two double bedded rooms and two bathrooms with bath and jacuzzi. 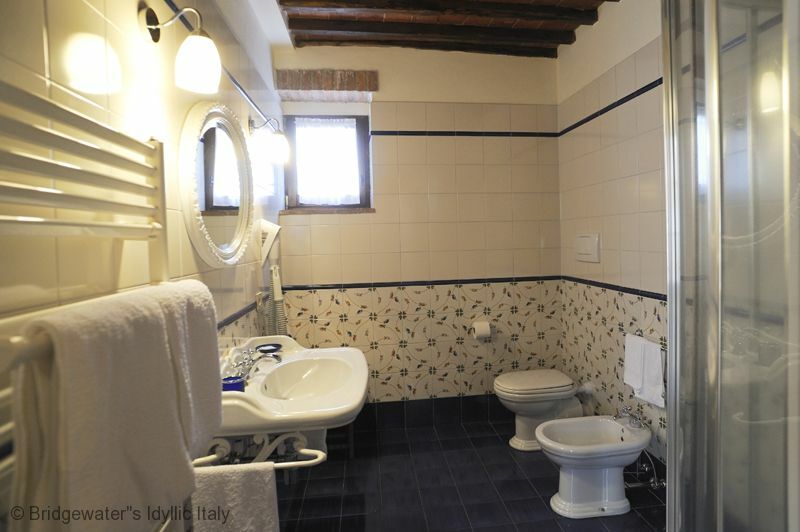 (This apartment is only rented together with the main villa ). 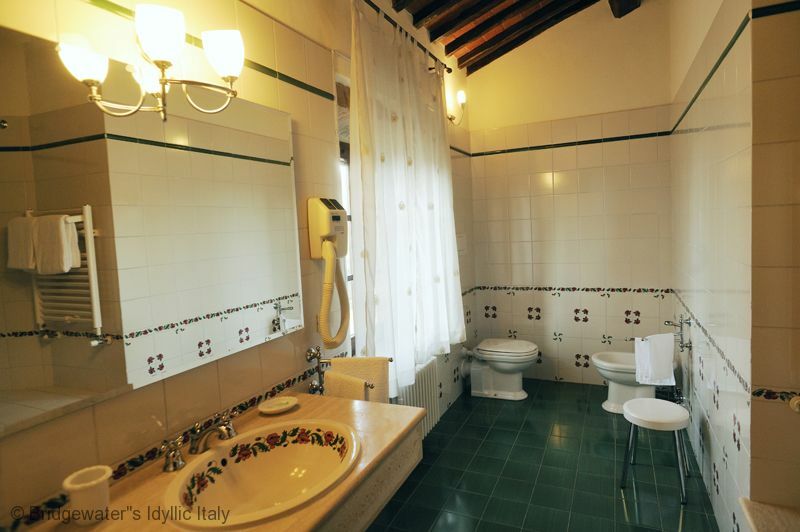 For smaller parties the main villa sleeping 16 to 20 people in 8 bedrooms is available at a lower weekly rental see 'Villa Trquanda piccola' for details. Villa Trequanda swimming pool offers stunning views over the countryside as far as Siena and (20 x 9 m, depth 1.20-1.50m) with Jacuzzi and solarium. The main produce of the farm is the excellent organic extra virgin olive oil as well as very rare “white truffles” that grows in the area. The farm also produces pecorino cheese and salami. Restaurant "Conte Matto" in the near village of Trequanda, 5 km is well worth a visit as is restaurant "Walter Redaelli" in Bettolle and "Enoteca 3 Terzi" in Siena. The nearest supermarket is in Trequanda. Bridgewater can organise a shopping service should you wish to have groceries waiting for you in the villa upon arrival. Maid service on request € 18,00/hr. Baby sitter on request € 20,00/hr. Air conditioned upon use ( temperature regulated on 20°)€ 4,00/hr. 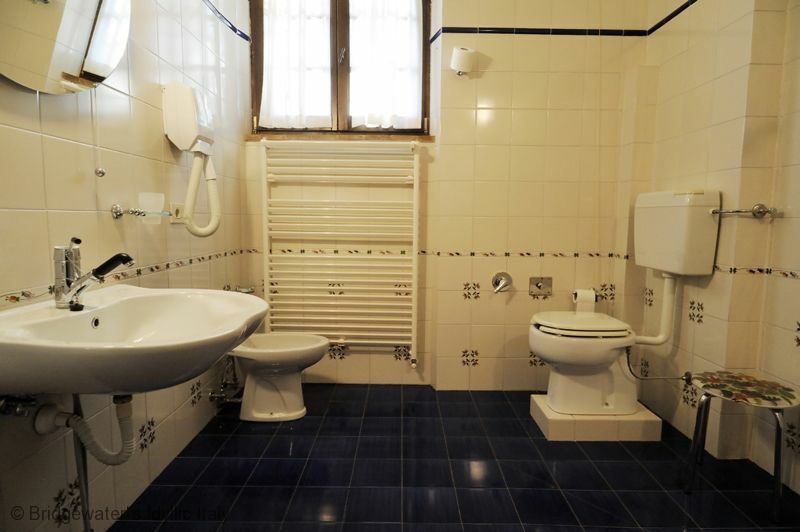 Villa Boscarello; € 1,50/hr. Bellaria. On request, meals starting from , € 25,00 p.p. drinks included. Breakfast on request starting from € 12,00 p.p. Cooking class: preparation of a complete menu and dinner, € 85,00 p.p. ( minimum 6 persons), drinks included. Pool (not heated )open from 01 May to 02 October. Inventory deposit: euro 500,00 ( cash ). We produce wine, extra virgin oil, wild boar salami, sheep milk cheese, grappa and a fortified wine... white truffles are naturally growing in our property!! - Italian Buffet Breakfast: milk, tea bags, sugar ( brown and white ) juices, water, fresh seasonal fruit, bread, jams, nutella, honey, lemon, butter, yogurt, mix cereals, croissants, home make cakes. Hot from the kitchen: cappuccino, espresso, americano, hot water. - Continental Breakfast: milk, tea bags, sugar ( brown and white ) juices, water, fresh seasonal fruit, bread, jams, nutella, honey, lemon, butter, yogurt, mix cereals, croissants, home make cakes, prosciutto, salami, selection of Tuscan cheeses, boiled eggs. Service from the kitchen: scrambled and fried eggs, omelettes and crepes. Hot from the kitchen: cappuccino, espresso, americano, hot water. Tuscan dinner: menu can be personalized with Carlotta: 3 courses + dessert. Any particular request is welcome!